It's funny, as I was thinking about what to write about this week I thought of the movie Saving Mr. Banks. And then I noticed that Nikki wrote about it on Friday. I kept trying to think of other ideas and I thought of writing about a few other things, but all of the ideas I had really related to the movie. If you haven't seen the movie it was great. I laughed a lot, cried a lot and was really inspired. 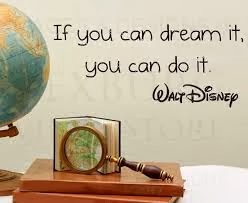 Walt Disney really inspires me. I feel that he is one of those people that just never gave up. Not just on making the movie Mary Poppins, but in all that he did. He believed in himself, he had failed businesses and kept on going. Writing can be hard, I feel like giving up. Some might even think I have a bad idea or I can't finish. There will always be twists and turns. 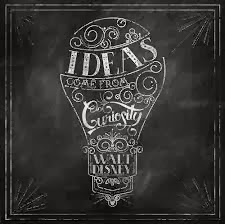 I often think of Walt Disney who said, "We keep moving forward, opening new doors and doing new things, because we're curious, and curiosity keep leading us down new paths." It is so true what he said. You have to keep moving. There are going to be hard times, and bad ideas, but if I just give up what does that do for me? I may have to put that idea in the back of my mind for awhile, but I can't just rip it up and throw it away. It took Walt Disney 20 years to get Ms. Travers to even consider the idea of Mary Poppins the movie. Don't take advantage of the process, enjoy the ride.I am getting nervous to finish my story, I have spent several years working on it and I just don't want it to end. I am curious to see this movie because a few years ago a read a biography on Walt Disney and from all accounts he was a real jerk- never gave anybody any credit or praise for their work and worked everyone to death.